Follow our tips on styling floral dresses to cool the rising temperatures. 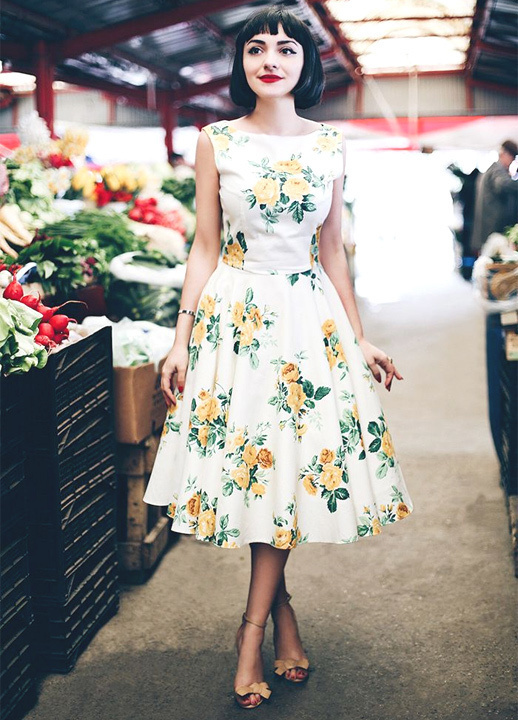 Exclusive fashion tips on choosing the best floral patterns and skirt and top fashion looks. For glittering occasions, read about floral print dresses for weddings. Floral prints and summer season are synonymous to each other. Floral fashion is never out of trend even for high-end designers. Florals keep topping the trends chart and even this year, floral print dresses have outdone themselves by ranking topwards among fashion trends 2018. Designers offer their summer collection almost every year inspired by abstract or realistic florals but one thing remains common and that is their love for seasonal floral print dresses in various designs. Even simple floral patterns are being keenly eyed by fashionistas. can help you rock spring summer 2018 trends. You may decide to match it with a denim jacket, trendy scarf or layered dresses to shine bright this season. There is an exclusive section on floral skirt and top combinations that you’ll love to read about. Floral skirt and top fashion looks can come off as classy and feminine when chosen wisely. Long floral shrugs as an add-on can look particularly chic as well. Floral prints and florals add a delicate feminine touch to the outfit with a hint of romance in the air. Speaking of romance, we’re also talking wedding bells! You read right. Read on to discover to choose the perfect floral print dresses for weddings. In this article, we will try to share few fashion basics to keep in mind while sporting breezy dresses to keep yourself cool this summer season. Best of Fashion Trends 2018: Floral print dresses for a fresh summer! The floral pattern is generally considered feminine and romantic and it is just as well that florals are an integral part of spring summer 2018 trends. You may feel that floral outfits may be a little complicated to coin with your current wardrobe. To get a more chic and fashionable look, your floral clothes can add a twist of magic to your style statement. Choose to wear a bright dress with flowers or a pastel coloured print but make sure to pair them with right accessories for dresses in order to get a timeless piece. A long flower print maxi dress from your floral outfits range, with high heel and simple stud earrings can make you look like a princess in the hot summer. If you are into casual playtime look then club your short floral print long shirt dress with a pair of sneakers or ankle boots. You can also never go wrong with a leather belt and a light shrug to get an extra refined figure with loose summer dresses. Speaking of shrugs, there are so many long floral shrugs that can reinvent your basics and give your plain or floral short dress major style boost. Make sure to understand your body type to choose the perfect floral clothes for yourself this summer to look your best with high-end summer trends. Based on your body shape you can choose from bright eye-catching floral print dresses to hide or flaunt your best features. You could go for a loud or a simple floral pattern, depending on your taste! Bring on the Florals! Cute floral print dresses for a great spring summer season! Every year floral fashion floods the retail stores with latest summer trends. Give your wardrobe a summer makeover with the latest from spring summer 2018 trends. Flatter yourself with the recent booming colour palette in the dresses range. You can also play a little with contrast by pairing neutral plain colours with the bright floral pattern. There is no denying that beautiful flowers nifty print and display lustrous elegance when matched with basic accessories for dresses but that does not mean you are not allowed to experiment with brighter and suave fashion. The bright and bold floral print offers a playful ladylike look to the contrary serious solid winter look. Black floral dress outfit- Some like it Black! This is romance at its best. Floral fashion can be elegant and playful at the same time. The black floral print short dress outfit is a very general term to describe a perfect floral clothes but it is that versatile. The design can be anything from multi-coloured to single coloured, bright or neutral pallet, or even a simple floral pattern. But, it will make an extremely loved dress with flowers, till the time the fabric is of good quality. Natural fabrics like cotton are more favourable in summer than polyester. These fabrics are breathable and dry easily in case of excessive sweating in contrast to synthetic cloths. They’ll serve as great material for your floral print clothes. Also, try to choose a black floral outfit with a lighter coloured pattern. A solid black dress black is more suited to colder weather. Clutches, shoes and scarfs can be matched to give a complete touch to your outfit. Long floral shrugs are always go-to add-ons for a fresh and breezy look. Pink and White dress outfit- Strawberry kiss! The white floral dress could a very common fashion staple in the summer season but heard of the pink and white dress that is making some noise this season? You can look different if you choose unique and bright accessories for dresses For summer purposes, choose light jewellery and avoid heavy ornamentation such as beads or metal pieces as these might cause skin irritation due to sweating. If possible, wear minimum jewellery such as light earrings over your floral print dresses, as they do not touch the skin much as compared to rings, bracelets or necklaces. If you do not like to wear simple white floral dress, the pink sand white dress in long dress styles will steal your heart. You could later try a more patterned look by adding a soft shrug featuring a simple floral pattern to grace your attire. Go for contrast shades shoes or heels to pair up with the light pattern, for example, you can try pairing your white floral dress with tan shoes to give a defined outline to the whole outfit. Black and white dress outfit- Keeping it Natty! The best thing about black and white floral print dresses is that you can straightaway transform as well as upgrade your style with a single dress piece. If you are confused about how to choose accessories for dresses, then don’t be. Your flowery dresses will make you look like a dream. 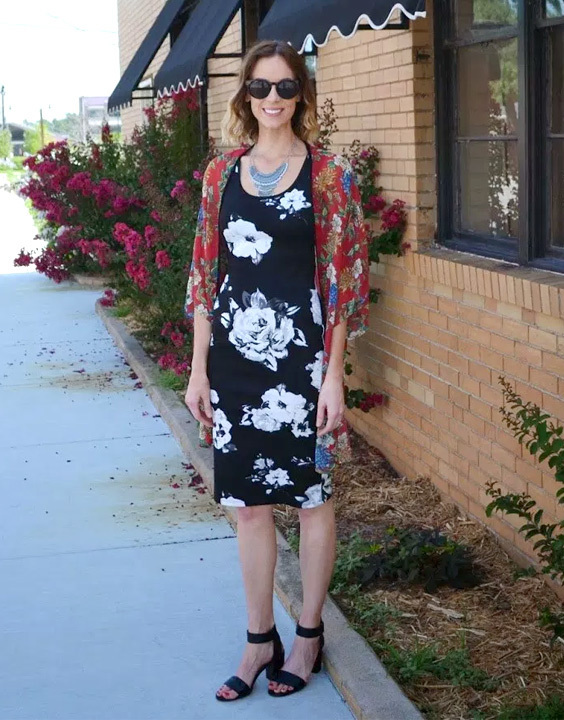 Keep a scarf or if you want to punch up the floral appeal, choose long floral shrugs instead and these can prove to be beneficial on a hot summer day and add a rich look to any flower print dress. As our last tip for floral fashion this season, make sure that you use sunscreen whenever you step out in the sun and keep yourself covered up. Your long-sleeved dress with flowers can help with this. You can also use light jackets, long floral shrugs, sunglasses and scarves to avoid direct sunlight. The evergreen match of spring summer 2018 trends with floral fashion is classic. This year also, you can count on countless talented designers to display the best of their designs this summer. Choose from numerous unique patterns in cute flowery dresses and get ready to flaunt your floral outfits paired with trendy shoes and sunglasses. Floral Skirt And Top Combination - Looking beyond floral dresses! If you’re looking for a floral skirt outfit, we’re obviously talking about a realm that goes beyond floral dresses. It it true that florals can spice up everything. Your floral outfits can certainly involve floral skirt and top fashion. Floral long skirt outfits are natty in their own right. Pair a long skirt with a crop top, add a dash of minimal jewelry, and you’ll have a look that’ll keep you on-trend this season. The skirt and top fashion looks completely charming when highlighted with glossy accessories for dresses. Make your floral skirt outfit a clear winner by choosing a vibrant skirt preferably teamed with an intense colored top, and exude confidence in a pair of classy pumps. There is a lot that you can do with the floral top and skirt style. Start experimenting today! Floral Print Dresses For Weddings - Dresses Can Be Divine! Can you imagine your wedding in the midst of a beautiful meadow? How do you look? Can you visualize yourself? What if we told you that a floral dress can make you look like an ethereal princess on D-day? It’s possible! 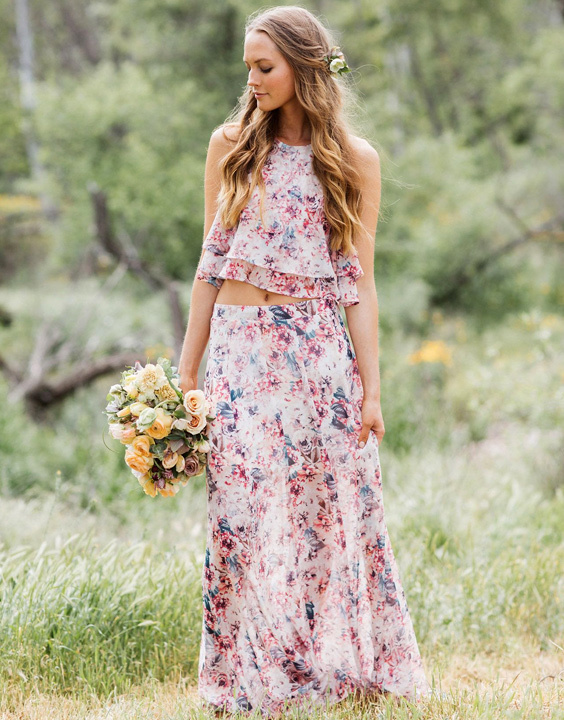 Floral print dresses for weddings are a thing! Look absolutely stunning in a floral pattern dress and make sure to add some dainty accessories to make a powerful statement. If you’re the bride avoid hot colours. Play it a little mellow with pastel shades and wear a mesmerizing one-piece flower-print dress. Minimalist jewelry would serve as perfect accessories with gown. While pink pastels could be a flattering option, your floral print gown design could also do with some powdery blue! If the floral blue does not appeal to the bride-to-be, it is a tailor-made option for the bridesmaid. Your choice of floral theme party dress could be less sedate and more sassy, because your dress must compliment those groovy moves! Try a halter-dress, or a flower print dress featuring a scoop-neckline. Make the wedding and the wedding party memorable with some awesome style numbers! Live up the party and scatter your closet with the freshness of blooms!